Harp for Today is a comprehensive harp method. 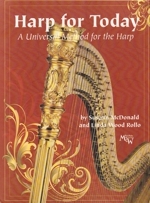 The book includes the fundamentals of harp technique, many progressive exercises and helpful supplementary advice. Each technique is explained succinctly and simply, with accompanying photos and suggestions to aid in correct execution. After publishing our five-volume Harp Olympics for children, many teachers requested that we write a method book geared toward adults and teenagers. In our experience as teachers, we, too, have felt a need for this kind of practical instruction book, which introduces and clearly explains fundamental harp techniques and then, through the use of additional exercises, develops facility. We also seek to encourage and inspire fine young professional harpists in the "Supplementary Advice" chapter, which includes such topics as: Artistic Performance; Preparation for Concerts, Competitions and Auditions; Memorization; Gestures; Dynamics; Tone Quality; Chords; Program Planning; Suggestions for Effective Practice and Career Considerations. It is our hope that Harp for Today will enable many to realize their dream of playing the harp.